Insect screen offers first-line defense against insects for your home's vents. Adding screen or mesh to bar bugs is a nontoxic strategy called exclusion. By keeping the bugs out, you reduce the risk of having to get rid of an infestation later. Insect screen works against cockroaches, stink bugs, bees and other insects you need to keep out of your home, while allowing sufficient air flow. 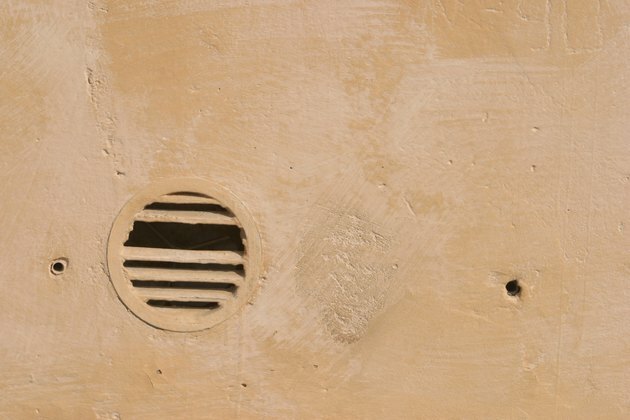 Unscreened vent holes offer access to pests. Check local building codes before you add insect screen or mesh vent covers. If the International Building Code or International Residence code are in effect in your location, screens to keep out animals and insects are required on vents, and there are specific acceptable materials. In flood zones, additional requirements may pertain to allow for the flow of flood water. Remove the vent cover, if there is one, by unscrewing the screws holding it in place. Slide a flat-head screwdriver under the frame near the center of the top of the vent grill to pop it out. Pry it again from the bottom, if needed. Unroll insect screen on a piece of cardboard or a workbench. Put on safety goggles and work gloves. Some screen materials can cut your hands or get in your eyes. Cut around the vent cover's outside edge, using it as a pattern to make the insect screen the right size for the vent hole. Alternatively, measure the vent hole's height and width and add 1 inch to each dimension. For example, for a standard foundation vent of 16 inches by 8 inches, cut a 17-inch by 9-inch piece of screen. Center the screen over the opening. Replace the vent cover on top of the insect screen. Otherwise, staple the screen in place with staples 1 inch apart, keeping your fingers clear of the staple gun. Use caulk to attach the screen to brick or stone by applying a bead 1/4 inch from the opening on all sides and pressing the screen firmly into the caulk. Follow all product instructions and warnings. Cover all the vent holes with insect screen in the same manner. Caulk any cracks in the foundation, walls and window frames. Check for openings around pipes. If you can see light coming through a crack, an insect can get into your home.